With 3000 attendees Devoxx is the largest Java Community conference world-wide. Each year in autumn it takes place in Antwerp/ Belgium, in recent years in the Metropolis cinema. The conference tickets were sold out long before doors were opened this year. 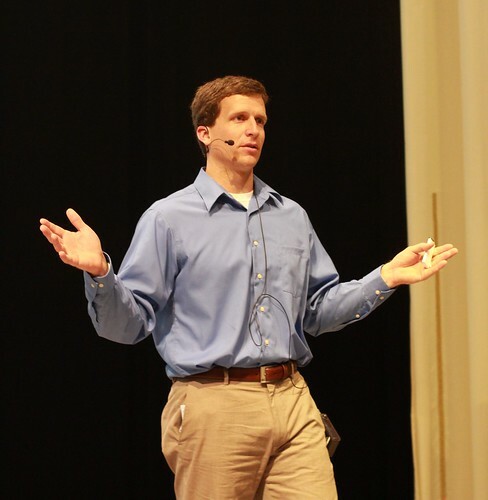 The focus of the presentations are mainly on enterprise Java featuring talks by famous Joshua Bloch, Mark Reihnhold and others on new features of the upcoming JDK release as well as intricacies of the Java programming language itself. This year for the first time the scope was extended to include one whole track on NoSQL databases. The track was organised by Steven Noels. It featured fantastic presentations on HBase use cases, easily accessible introductions to the concepts and usage of Hadoop. there being very different problems to be solved in the enterprise world vs. the free software, requirements and scalability driven NoSQL community. Although even comparably small companies (compared to the Googles and Yahoo!s of this world) in Germany are already facing scaling issues, these problems are not yet that pervasive in the Java community as a whole. To me this was rather important to learn, as coming from a Machine learning background, now working for a search provider and being involved with Mahout, Lucene and Hadoop scalability and a growth in data has always been one of the major drivers for any projects I have been working on so far. Even when faced with growing amounts of data in the regular enterprise world developers seem to be faced with the problem of not being able to freely select the technologies to be used for implementing a project. In contrast to startups and lean software teams there still seem to be quite a few teams that are not only given what to implement but also how to implement the software unnecessarily restricting the tools to use to solve a given problem. One final factor that drives developers adopting NoSQL and cloud computing technologies is the observation for the need to optimise the system as a whole – to think outside the box of fixed APIs and module development units. To that end the DevOps movement was especially interesting to me as only by getting the knowledge largely hidden in operations teams into development and mixing that with the skill of software developers can lead to truly elastic and adaptable systems. Currently on my way back from a series of conferences in the past three weeks in the IC from Schiphol. After three weeks of conferences, lots of new input and lots of interesting projects I learned about it is finally time to head back and put the stuff I have learned to good use. As seems normal with open source conferences I got far more input on interesting projects than I can expect to ever get applied in on a daily basis. Still it is always inspiring to meet with other developers in the same field – or even quite different fields and learn more on what projects they are working on, how they solve various problems. A huge Thank You goes to the DICODE EU research project for sponsoring the Apache Con and Devoxx trips, another Thanks to Sapo.pt for inviting me to Lisbon and covering travel expenses. A special thank you to the assistant at neofonie who made travel arrangements for Atlanta and Antwerp: It all worked without problems even up to me having a power outlet in the train that is finally taking me back. 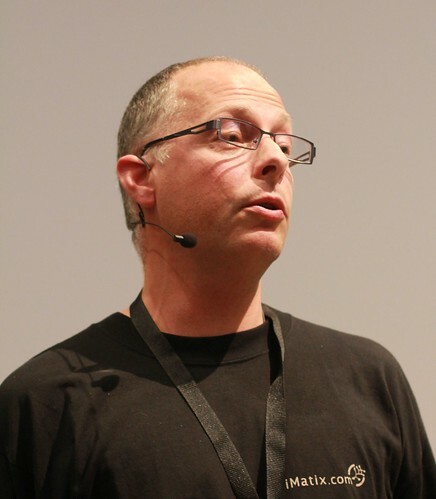 This year's Devoxx will feature several presentations coming from the Apache Hadoop ecosystem including Tom White on the basics of Hadoop: HDFS, MapReduce, Hive and Pig as well as Michael Stack on HBase. In addition there will be a brief Tools in Action presentation on Monday evening featuring Apache Mahout. Please let me know if you are going to Devoxx - would be great to meet some more Apache people there, maybe have dinner at one of the conference days. This evening the first Machine Learning Gossip meeting is scheduled to take place at 9p.m. at Victoriabar: Professionals working in research advancing machine learning algorithms and industry projects putting machine learning algorithms to practical use meet for some drinks, food and hopefully lots of interesting discussions. If successful the meeting is supposed to take place on a regular schedule. 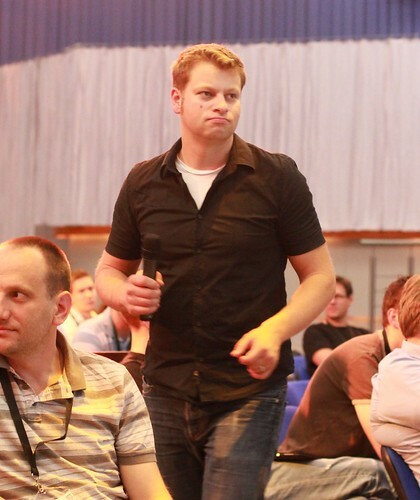 Ask Michael Brückner for the date and location of the next meetup. This is to announce the next Apache Hadoop Get Together sponsored by JTeam that will take place in newthinking store in Berlin. As always there will be slots of 30min each for talks on your Hadoop topic. After each talk there will be a lot time to discuss. You can order drinks directly at the bar in the newthinking store. If you like, you can order pizza. We will go to Cafe Aufsturz after the event for some beer and something to eat. Max Heimel: "Hidden Markov Models for Apache Mahout"
Abstract: In this talk I will present and discuss an implementation of a powerful statistical tool called Hidden Markov Models for the Apache Mahout project. Hidden Markov models allow to mathematically deduce the structure of an underlying - and unobservable - process based on the structure of the produced data. Hidden Markov Models are thus frequently applied in pattern recognition to deduce structures that are not directly observable. Examples for applications of Hidden Markov Models include the recognition of syllables in speech recordings, handwritten letter recognition and part-of-speech tagging. Sebastian Schelter: Distributed Itembased Collaborative Filtering with Apache Mahout"
Abstract: Recommendation Mining helps users find items they like. A very popular way to implement this is by using Collaborative Filtering. This talk will give an introduction to an approach called Itembased Collaborative Filtering and explain Mahout's Map/Reduce based implementation of it. Please do indicate on Upcoming if you are coming so we can more safely plan capacities. JTeam is looking for Java developers and search enthusiasts. Check out their jobs page for more info! As always a big Thank You goes to newthinking store for providing the venue for free for our event. 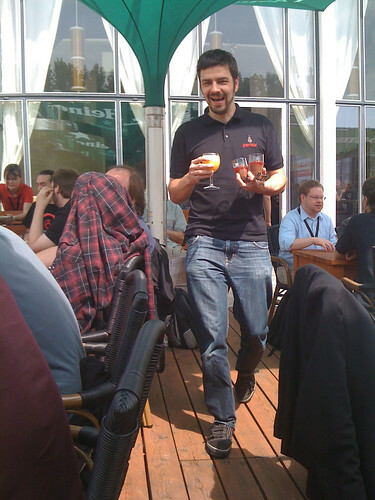 the evening after FrOSCon - that is on August 22nd 2010 at 7:30p.m. CEST - a combined "FSFE Fellowship meetup/ Apache dinner*" takes place in Tigges in Düsseldorf (Brunnenstraße 1, at Bilker S-Bahnhof). Given it doesn't rain, we'll be sitting outside. Would be great to meet you there for tasty food, interesting discussions on Apache in general, as well as projects like Lucene, Hadoop or Tomcat in particular. Anyone interested in either the FSFE or Apache is welcome to join us. One personal request: Somehow, Rainer (Kersten, FSFE) talked me into preparing a talk on what the ASF is all about - would be really great to have more people around share their experience. Last November I innocently asked Grant what it would take to make him to give a talk in Berlin. The only requirement he told me was that I'd have to pay for his flight. About eight months later we had Berlin Buzzwords - a conference all around the topics scalability, data storage and search. With Simon Willnauer, Uwe Schindler, Michael Busch, Robert Muir, Grant Ingersoll, Andrzej Bialecki and many others we had quite a few Lucene people in town. From the NoSQL community, Peter Neubauer, Rusty Klophaus, Jan Lehnardt, Mathias Meyer, Eric Evans and many others made sure people got their fair share of NoSQL knowledge. With Aaron Kimball, Jay Booth, Doug Judd and Steve Loughran we had several Hadoop and related people at the conference. The conference also featured two talks on Apache Mahout: An overview from Frank Scholten as well as a more in-depth talk by Sean Owen. It's great to see the project grow - not only in terms of development community but also in terms of requests from professional Mahout users. 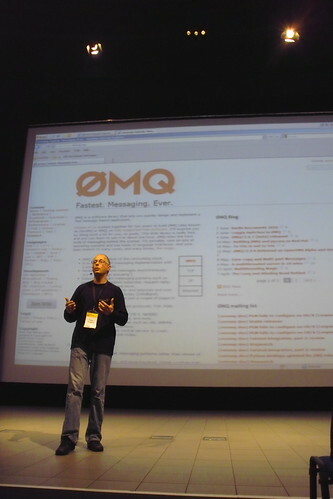 In addition we had a keynote by Pieter Hintjens that concentrated on messaging in general and 0MQ in particular - a scalability topic otherwise highly underrepresented at Berlin Buzzwords. We got well over 300 attendees that filled Berlin Kosmos - a former cinema. 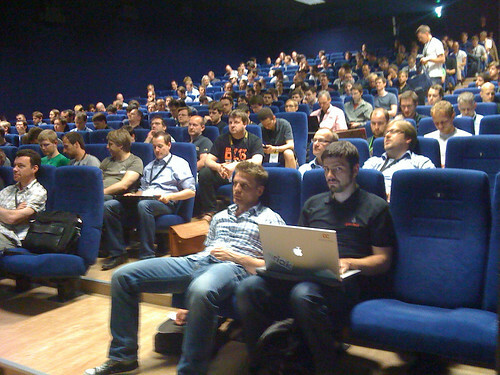 Attendees were a good mixture of Apache and non-Apache people, developers and users. People used the breaks and bar tours after the event to get in touch, exchange ideas. It's always good to see developers discuss design issues and architectural challenges. Monday evening was reserved for local people taking out the speakers and interested attendees for Bar Tours to Friedrichshain. Those from Berlin took Berlin Buzzwords people to their favourite restaurants and bars - or to what they considered to be "typical Berlin". Some spent evenings later that week drinking beer or Berliner Weisse. The tour for keynote speakers Grant Ingersoll, Pieter Hintjens and friends was organised by Julia and myself. We went over to Kreuzberg - some went to famous Burgermeister for Burgers, the other half went to a nearby Indian restaurant. After that we spent the evening in Club der Visionäre - a club next to the water. Me personally I left at about midnight - several people of the Lucene community moved to the well known Fette Ecke later on. Keynote speakers got a special treatment - that is a personal city guide for the weekend before Buzzwords. 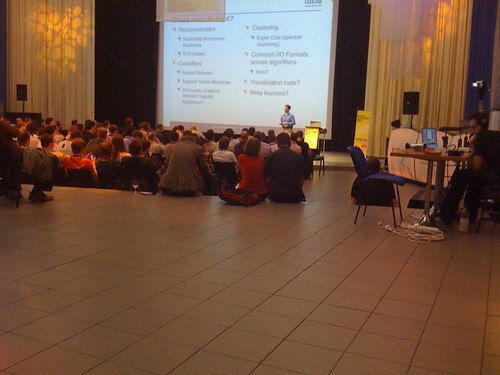 We had the official conference start on Sunday with a Barcamp. 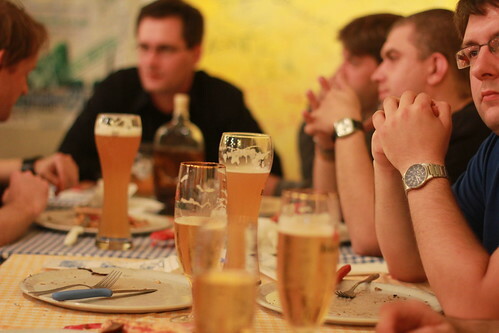 We had another Apache dinner on Wednesday with those Apache people that live in Berlin. In addition the Aaron and Sarah joined us as they were still in town for the Apache Hadoop trainings. Also Greg Stein had pizza and beer with us - he was in town for the svn conference at the end of the week. Thanks to all who helped turn this conference into a success: Julia Gemählich for conference management, Ulf and Wetter for WiFi setup, Nils for travel management, Simon and Jan for support ranking talks and reaching out to your communities, all speakers for fantastic talks, those taking pictures of the conference and sharing them on Flickr for showing those who stayed at home how great the conference was, peoplezapping for the videos that will soon be available online, all sponsors for supporting the conference, all attendees for their participation. 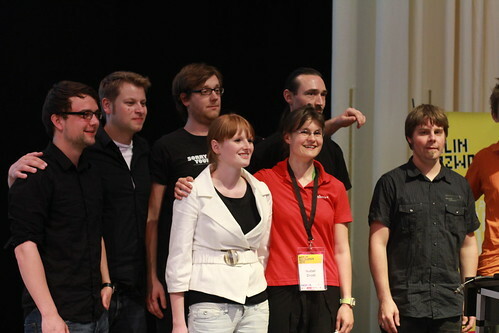 I'd love to have all of you (and many more) back in Berlin next year. An informal call for presentations has been set up already - submit now and be the one to set the trend instead of just following the Buzzwords! For those who do not want to wait for another year: We will have another Apache Hadoop Get Together in September 2010 - watch this space for more information. If you'd like to give a talk their and present your Hadoop/ Solr/ Lucene etc. system - please get in touch with me. About two years ago, after having started Apache Mahout together with Grant Ingersoll, Karl Wettin and others, several Apache Hadoop user groups, meetups and get togethers started to pop up all around the world. The one closest to me was the Hadoop user group UK. Back in 2008 I was pretty envious to all these user groups - being so distributed, there was no way I could ever attend all of them, though talks were certainly interesting. So the naive thought of a back then naive free software developer was: Let's have that in Berlin. To have initial talks I called Stefan Groschupf. His answer was very positive: Oh yeah, let's do this. I am in Germany for another two weeks, so it should be at about that timeframe. We agreed that if no-one showed up, we could still have some pizza together and share insights from our projects. For the venue I knew from regular meetups of the Free Software Foundation Europe - read FSF*E* - that newthinking store was available for free for meetups for devs of free software. On I went, calling Martin from the store, booked the room. After that some mails went to the usual suspects, mailing lists and such. At the first meetup two years ago, more than 15 attendees - with two more people who had prepared slides. Pizzas obviously had to wait a little. If you are wondering what that looked like back then - Thanks to Martin for taking the image back then and putting it online. We (as in all attendees) decided to repeat the exercise three months later*, talks for the next time were proposed during that first session. Noone objected to having it in Berlin again - everyone knew this was the only way to avoid having to do the organization next time. 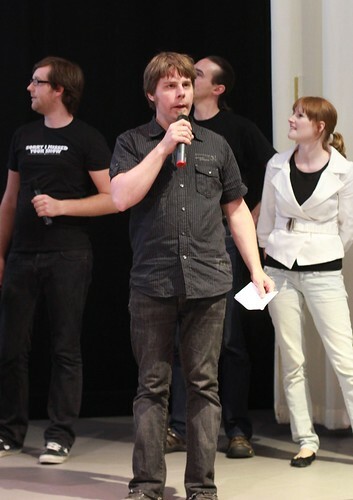 During that meetup the idea was born for a larger NoSQL conference in Berlin in 2010. First ideas were tossed around together with Jan and Simon Willnauer during Apache Con US in Oakland. The topic Hadoop got added there. In January 2010 finally Lucene was added to the mix. We contacted newthinking for support - got a very warm welcome. 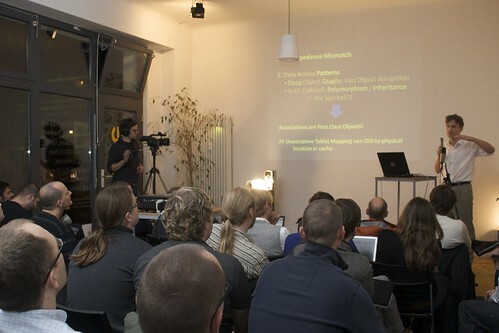 Now - two years after the first Apache Hadoop Get Together Berlin we are proud to host Berlin Buzzwords - focussed on NoSQL, Apache Hadoop and search as in Apache Lucene.The conference is co-organised by newthinking communications, Simon Willnauer, Jan Lehnardt and myself. A big thanks to neofonie for supporting me by making it possible that I could do most of the organisation during my regular working hours. The speaker lineup looks fantastic. Registration is going very well - exceeding expectations (did I mention that registration is still open, group and student tickets still available?). I am really looking forward to an amazing conference on 7th and 8th of June. 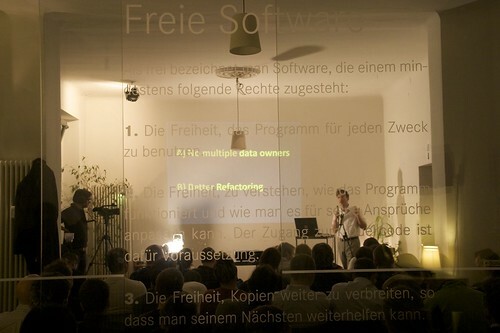 We will have a NoSQL barcamp in newthinking store Sunday evening before the conference. Keynote speaker packages have been sent out and were well received. Hotel rooms for speakers are booked. We are about to pull together the last loose ends in the coming days. Happy to have so many guys (and a few girls) interested in scalability topics here in town at the beginning of June. Looking forward to seeing you in Berlin. * The second meetup turned out to be the first and so far only one that took place w/o the organiser - I broke my leg on my way to newthinking by getting hit by a BMW X5... *sigh* Note for other meetup organizers: Always have a backup moderator - in may case that was my neofonie manager Holger Düwiger who happened to attend that meetup for the first time back then.